I think a wine blogger can be considered “a spoiled wine blogger” when they receive an email to attend a ‘press luncheon’ to taste some wines. I also suppose a wine blogger is considered “a REALLY spoiled wine blogger” when you are invited to a ‘press lunch’ to taste delicious wines, at a hot-spot restaurant, with many of the local wine buying/press celebs, with a chef flown in from Argentina making the food pairing, and the daughter of a well-known Argentinian winemaking family conducting the tasting. All that being said, I do believe last week I was a REALLY spoiled wine blogger! Maybe even REALLY x2. Definitely REALLY x2 :) The wine press luncheon was put on by Winesellers Ltd., a wine importing company based out of Illinois, to showcase Santa Julia wines. 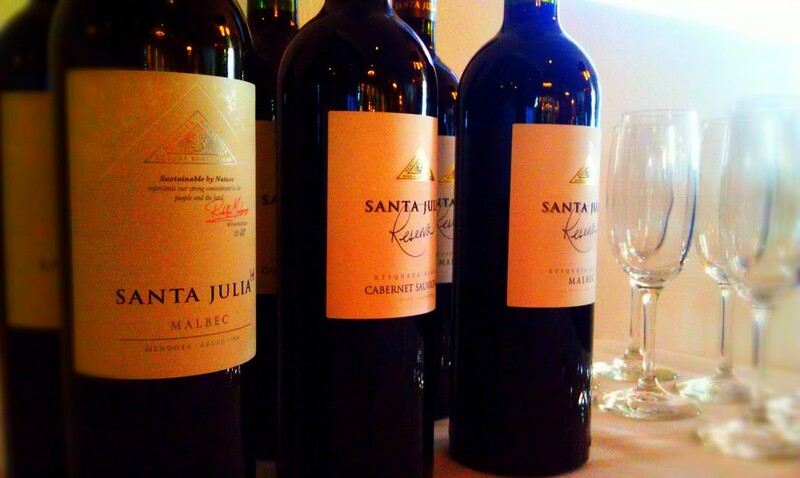 Santa Julia wines are a brand of wines produced by Familia Zuccardi, one of Argentina’s largest family owned wineries and a leading exporter of Argentine wines. The press luncheon was held here in San Antonio at Silo Elevated Cuisine (1604). The cuisine is both elevated and … elevated, literally (you have to ride the elevator to the main dining area). Once the elevator doors opened, I was welcomed by a few of the Winesellers Ltd folks who informed me that I was the first to arrive. 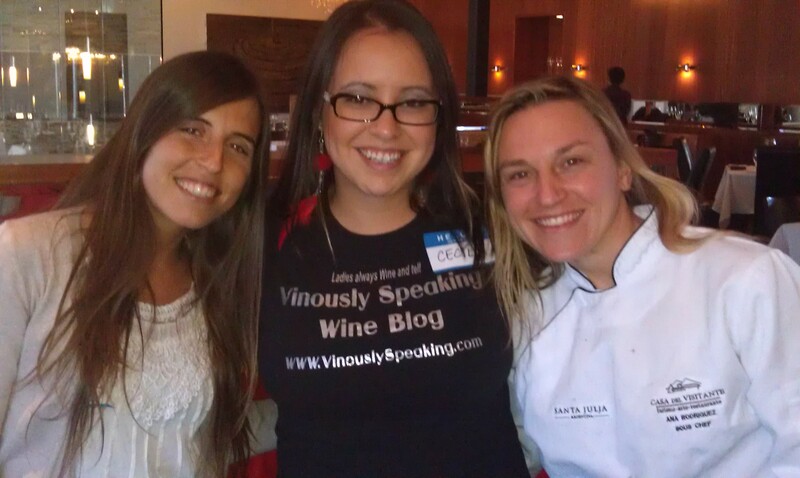 “As you are the first to arrive, you can have some one-on-one time with Julia Zuccardi,” I was told. So there I was, chillin’ with Julia … the daughter of the famous Zuccardi Family winery, small chattin’ it up – no big deal. Me [to myself]: Hmm … not sure where to go from here, she has a freakin’ line of wines named after her. Should I humor her and tell her how I have a one-vine vineyard in Chateau My-Backyardeaux that my dad planted for me? Nah, don’t start off that funny because then you have nowhere to go after that. Thinking back to it … I should have! 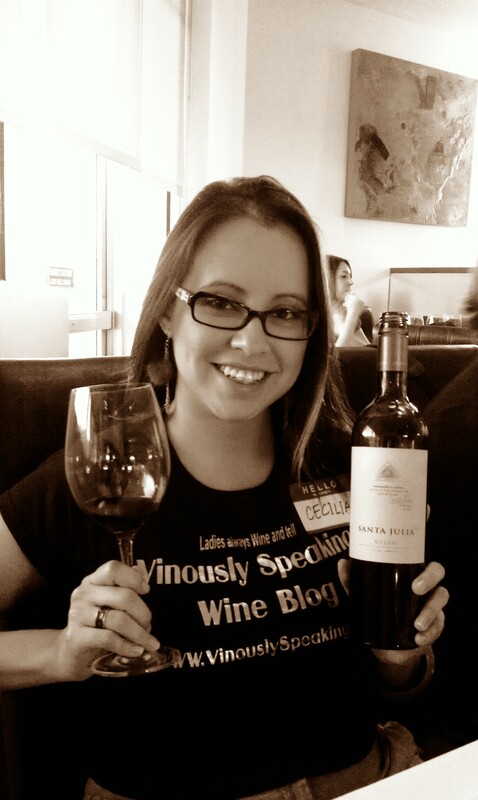 So after chatting with Julia Zuccardi for a bit, a few other people started showing up … the wine buyer for the major grocery chain here in Texas (HEB), our local Emmy award-winning journalist Tanji Patton … you can imagine how I am starting to feel a bit out of my league here, lol. Whatever … you have to think big to be big right? 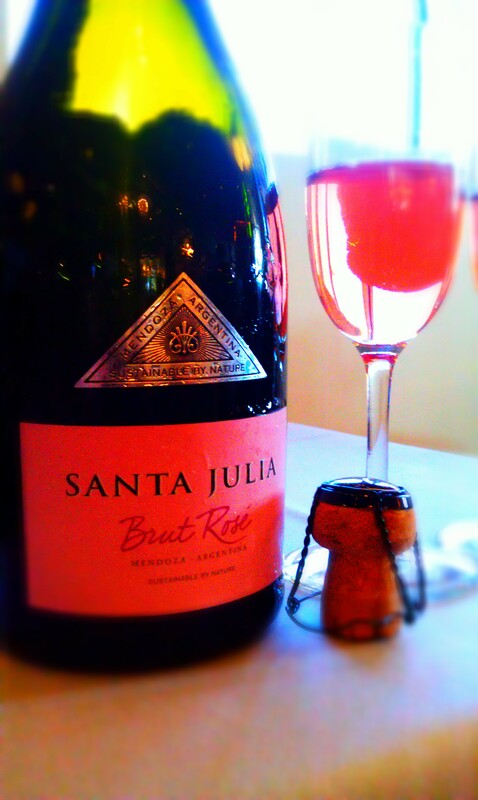 the Santa Julia Brut Rosé NV (NonVintage) 100% Pinot Noir. My first sip of this sparkling wine was delightful! It was bubbling with fresh red fruit and floral aromas, with delicate bubbles and beautifully balanced! As I was sipping on it, I imagined it being passed around as an aperitif at a fancy Thanksgiving feast or at a holiday party. I was thinking it was going to be priced at around $25 retail, but when I went to verify the suggested retail price (SRP) of it in our press packs, I thought there was a misprint … $13 ?!? Wow! This is one of those wines to have as your secret weapon for holiday parties ~ gotta make yo guests think you servin’ ‘spensive bubbly :) To pair with the Santa Julia Brut Rosé, Silo Restaurant prepared their Chicken Fried Oysters with Sautéed Spinach, Applewood Smoked Bacon, Tart Apples & Whole Grain Mustard Hollandaise 11! They were delectable! Mmmm! Love me some oysters! While we were waiting to for food to be served, Chef Ana Rodriguez Armisen, the Sous-Chef of Casa del Visitante (the Zuccardi Family’s restaurant in Mendoza, Argentina), who was touring with Julia Zuccardi, came out to and prepared Argentinean Chimichurri for us, which the Argentineans use to spead over meats that are grilled on the Asado aka bbq grill. And boy was this chimichurri delicious! As we were seated, the white wines were poured for us. 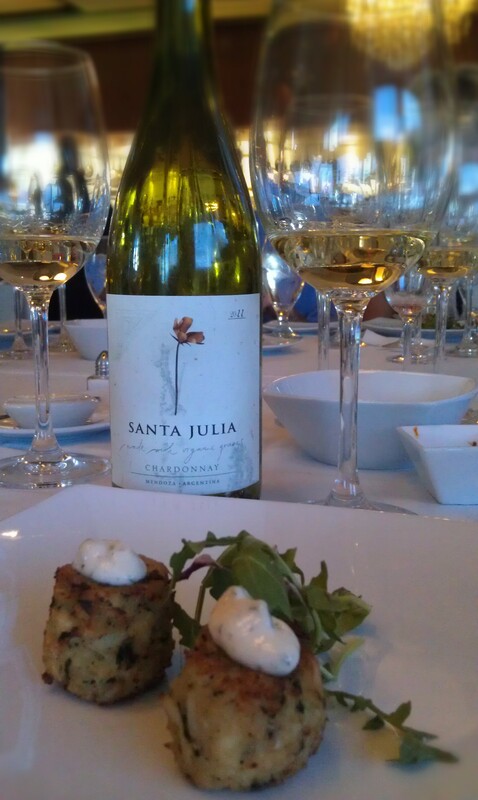 We began with the 2011 Santa Julia Organica Chardonnay. Within the brand Santa Julia is a line of wines known as Santa Julia Organica, which are available in Chardonnay, Malbec, Tempranillo and Cabernet Sauvignon. These wines come from certified organic vineyards. The 2011 Santa Julia Organica Chardonnay was simply a treasure. For those of you who are not fans of buttery, oakey Chardonnays, this one is for you. Aged in stainless steel tanks, this Chardonnay was crisp and lively, with aromas of tropical fruits, citrus, apple, pear and honey. And the gorgeous taste lingers for quite some time. (A characteristic true of all the wines I tasted that afternoon). 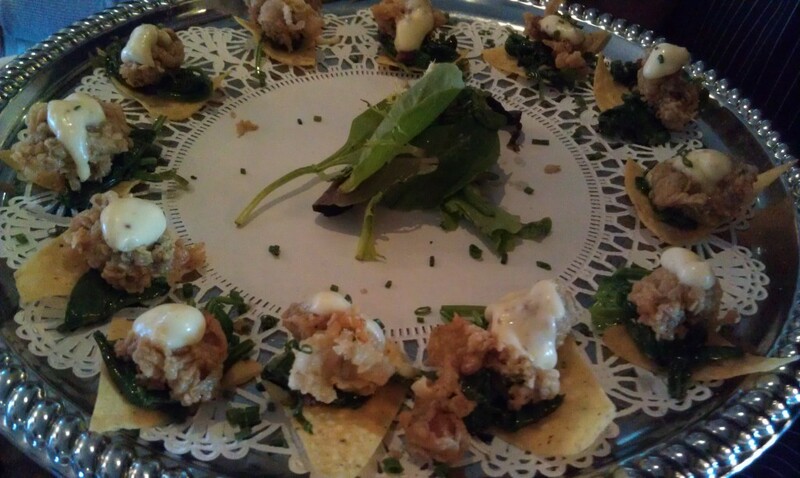 To pair with this wine, Silo prepared their Jumbo Lump Crabcakes with Fire Roasted Corn-Jalapeno Tartar Sauce. Oooooh Perfection! And the pairing was spot on! This wine is also a great with seafood, cream-based pastas, and soft cheeses. And the price on this wine, $11 SRP. Ya, you’re reading that right. Next we were treated to the 2010 Santa Julia [+] Torrontes, Argentina’s signature white grape and one of my personal favorites. It was a gorgeous blend of floral, spice and herb and various citrus aromas. The [+], aka plus, is the title is another “name” for a line of wines under the Santa Julia Brand. These [+] wines are a line that are bottled in lighter weight glass to lower C)2 emissions.This line is was created to be symbolic of the Santa Julia commitment to the people that work for them, maintaining healthy and sustainable vineyards, energy and resource conservation, and winery, and the preservation of the environment. 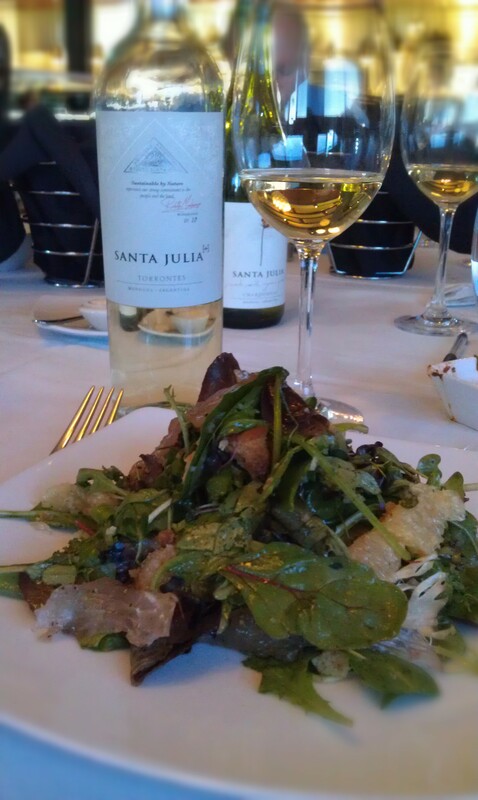 This wine was paired with a delicious and inventive salad prepared by Chef Ana – fresh green salad with mustard shoots, carob’s bread croutons, grapefruit segments, and cured flounder drizzled with grapefruit juice and manzanilla olive oil dressing. Ohhh! So Gooood! The cured flounder was amazing and the salad married well with the Torrontes, which is $10 SRP. BTW, the Zuccardi family also produces vintage olive oils! Julia’s younger brother is the one who heads that up. 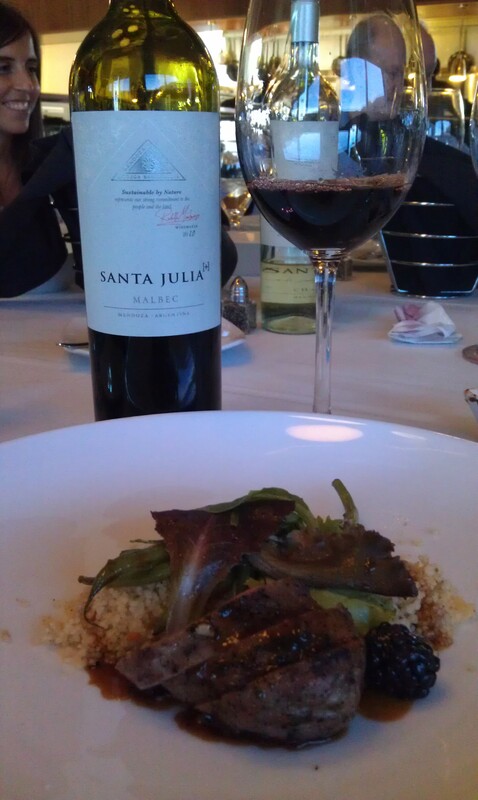 Next up was another of the [+] line, the 2010 Santa Julia [+] Malbec paired with Silo’s Pan Roasted Five Spice Duck Breast & Confit Leg on Almond & Apricot Couscous, Sautéed Haricot Vert, and Blackberry Cider Sauce. 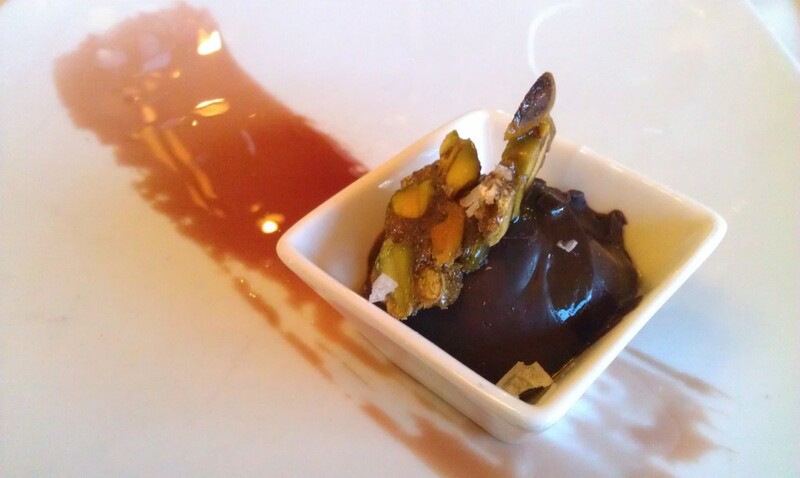 I can only quote “The Most Interesting Guy in the World” at this moment by saying, “I don’t always eat duck, but when I do, I prefer Silo’d Five Spice Duck!” And paired up with the hypnotic aromas of figs, plums, and blackberries, vanilla and coffee on the Malbec [+] at $10 SRP … Wunderbar! Now to prove how much of an appetite I have for a gal, while others at my table were wimping out, I tore into the next course. And when I say tore, I mean ripped into this tender lamb loin with gusto! 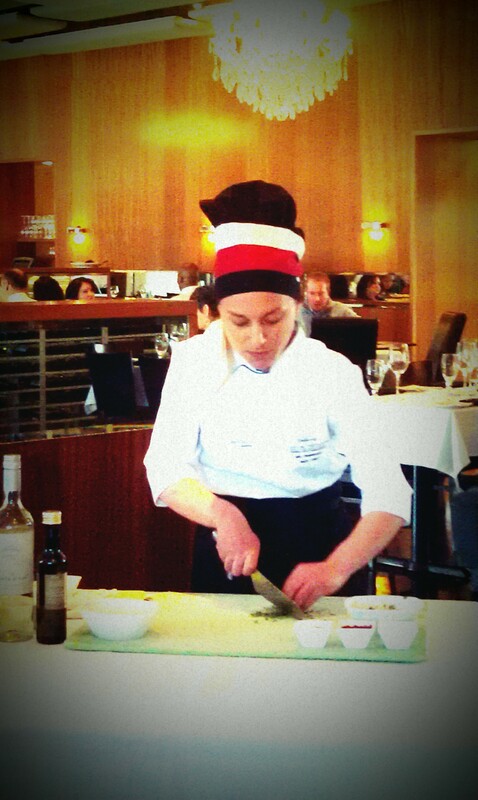 Chef Ana, will you please come and live with me so you make me this dish all the time! The lamb loin was cooked to perfection, aka between medium and medium-rare, with a crispy potato cake sauteed in Zuccardi Frantoio Olive Oil, then drizzled with a Malbec reduction sauce, and a warming salsa criolla! Ay Caramba!! The only thing that made this lamb more perfect was the wine that was paired with it, the 2010 Santa Julia Organica Cabernet Sauvignon, $11 SRP. Adding to the oral flavor tango that was happening in my mouth were the aromas of violet, cassis, black cherries, and black and sweet pepper of this wine! Yummo! 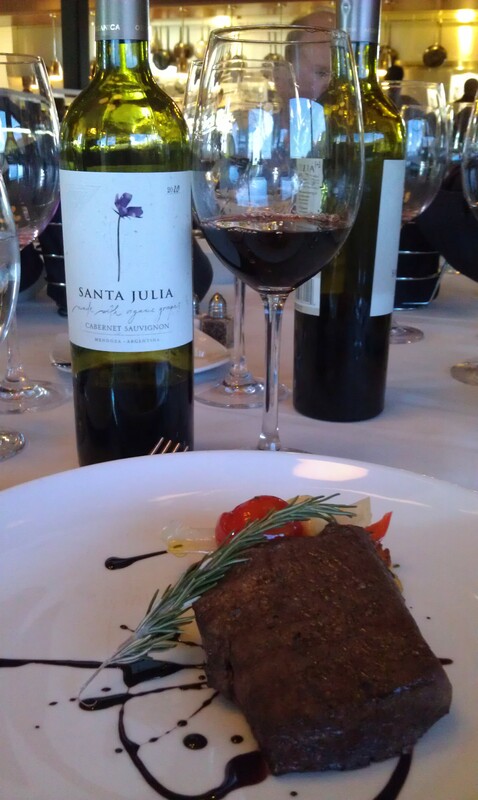 And just to show off how delicious this lamb loin was with other Santa Julia red wines, we were then poured the 2009 Santa Julia Reserva Malbec and the 2009 Santa Julia Reserva Cabernet Sauvignon … both gorgeous with the lamb! At $12 SRP fpr both, its hard to believe that you can drink ‘Reserva’ quality wines at an ‘everyday drinking’ wine price. 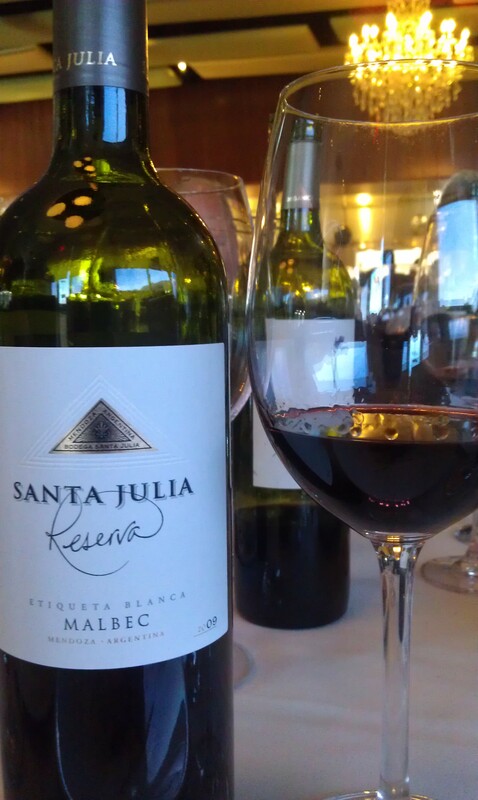 The 2009 Santa Julia Reserva Malbec was complex, structured, and had a long finish. The aromas were of dark fruits like figs, plums, and blackberries, hinted with coffee, vanilla, tobacco, and chocolate! Perfecto! I could’ve been fooled into thinking this wine was valued at minimum $25. 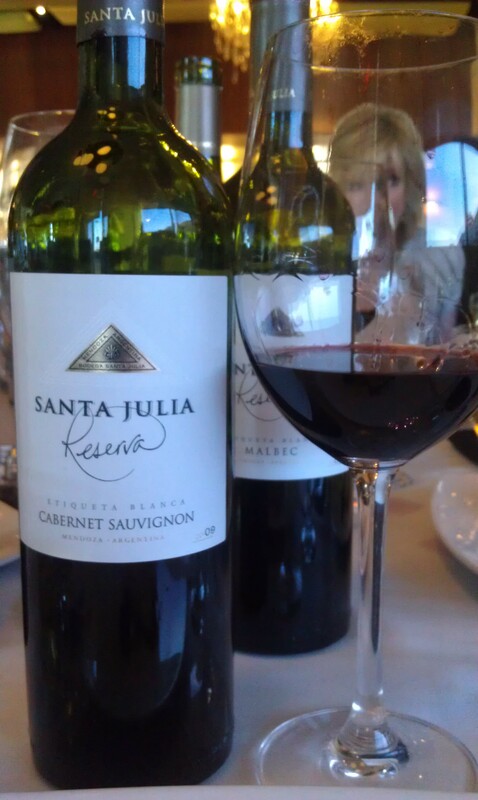 The 2009 Santa Julia Reserva Cabernet Sauvignon was spectacular too! It had the delicious red fruit notes of Cabernet Sauvignons, hints of earthy tones and bell pepper, and kisses of vanilla, leather, paprika and black pepper. Really a delicious, delicious wine. I just couldn’t wrap my head around how awesome these wines were and how much a steal they areat $12 SRP. 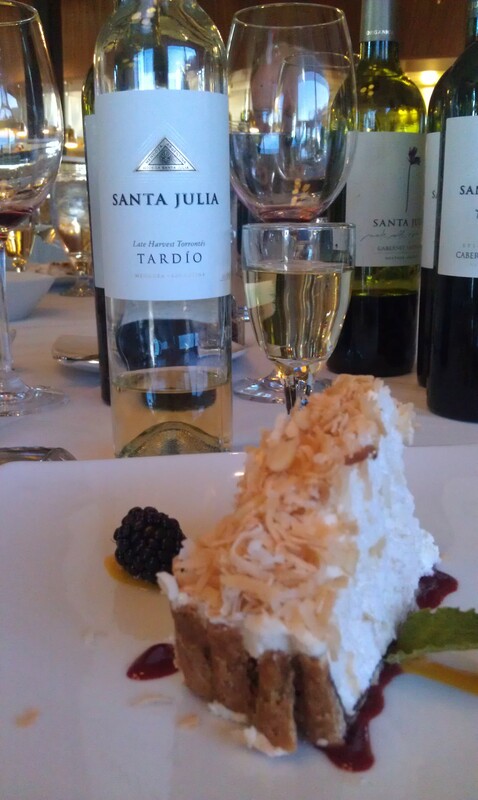 The wine that was paired with both desserts was the 2009 Santa Julia Tardio, $13 SRP. This late harvest wine had delicate yet powerful aromas of over-mature fruits, honey, dried fruits, orange skins and roses. The slight sweetness was washed away with gorgeous acidity, leaving you palate ready for more! Mmmmm! After the last plates were cleared away, there was no denying, The Ceci Sipper was officially THE Happy Camper! I was simply amazed at the incredible quality of these wines and the insanely affordable prices they run for. How have value buys like this missed my ear? I highly recommend you go out and buy a case of these wines, they deserve a large section in your wine rack. Another aspect of Santa Julia wines that I found to be very honorable and respectable, is the care they put into the people that work for them. Julia was telling us that they do not believe in hiring seasonal employees. Instead they cross train their staff to provide them permanent jobs, they also provide them with a cultural center, a book/video library, sporting facility, free classes and programs in literacy, foreign language, math, music, cooking, and healthcare!! They provide their staff with fitness and wellness programs at no charge, free computer science programs to the staff’s children, and assist their staff’s families in buying personal computers! How phenomenal is that!!?? All the more reason I will be buying these wines on a regular basis, and you should too! Thank you so much to Julia Zuccardi and Chef Ana for that delightful and insightful lunch at Silo’s, you ladies were charming and fun, I hope to meet you again, but this time in Argentina! 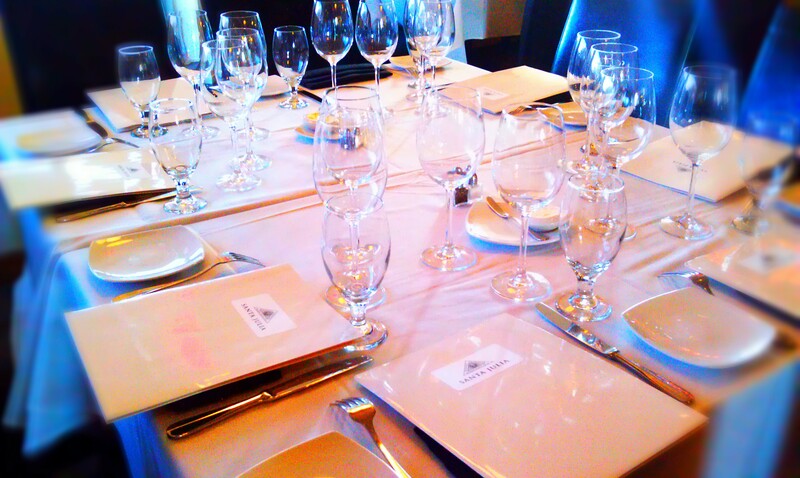 And lastly, thank you to Winesellers Ltd. on a job well done with the press lunch, bravo! P.S. I was so blown away with these wines at the luncheon that when I found out they were putting on wine pairing dinner that evening at Max’s Wine Dive here in San Antonio, I called ASAP to make reservations and was able to taste these wines again, with other delicious food pairings prepared by Chef Ana. And I brought 6 other friends with me. News of good wine travels fast in my circle :) I hope Julia and Chef Ana were impressed with my vinous devotion to Santa Julia wines, because it certainly ain’t ending there. Spread the word that Santa Julia is muy, muy sabroso!! Previous Previous post: Let’s Talk Showstopper(s)!